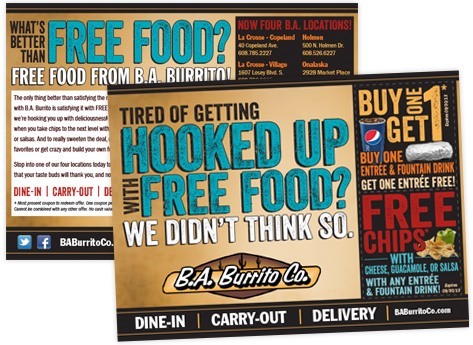 Whether you need to improve your business’ traffic, generate sales leads, or grow your customer database, you can count on The BLU Group – Advertising & Marketing in La Crosse, Wisconsin to help you cost-effectively exceed your goals with a direct mail campaign. No matter what type of printed format you are looking for, we can help. Some examples of popular formats include: postcards, booklets, self-mailers, and more. Knowing and understanding how to target your customers is an important key factor to direct mail marketing. Our design team will work with you to learn about your customers and design content that positively impacts your business and your customers. See some of the industries that we have developed direct mail campaigns for in the past include: product retailers, salons and spas, restaurants, jewelry retailers, and dentist offices.